Purchase of MacIntyre West Tract opens up Lake Andrew as a destination, though the state has yet to mark the route. Lake Andrew lies near the base of Santanoni Peak, whose Twin Slides are visible in the middle of the photograph. After writing about the state’s acquisition of the MacIntyre West Tract for the last issue of the Explorer, I was eager to explore it, and Lake Andrew seemed like the logical place to start. In early December, my friend Carol and I hiked the 4.7 miles to the lake and, on the way back, took a side trip to a spectacular view of the Twin Slides on Santanoni Peak. Although the state has yet to mark any trails on the tract, getting to Lake Andrew is pretty straightforward: we followed well-maintained logging roads for four miles and then followed a skid road for the remaining seven-tenths of a mile. The state bought the 5,770-acre tract from the Adirondack Nature Conservancy last year and opened it to the public on October 1. It was the latest phase of a multi-year plan to acquire sixty-five thousand acres formerly owned by the Finch, Pruyn paper company. The state expects to buy a companion tract, MacIntyre East, by the end of March. That purchase will greatly improve paddlers’ access to the Hudson and Opalescent rivers. If you want to explore MacIntyre West, you should be comfortable hiking on roads and trails that lack markers and that may not appear on maps. Also, be aware that the tract still has twenty-eight hunting camps owned by sportsmen’s clubs. The clubs must dismantle the camps by September 30, 2018, but until then the lessees have exclusive use of one-acre parcels around the buildings and they can drive to their camps. 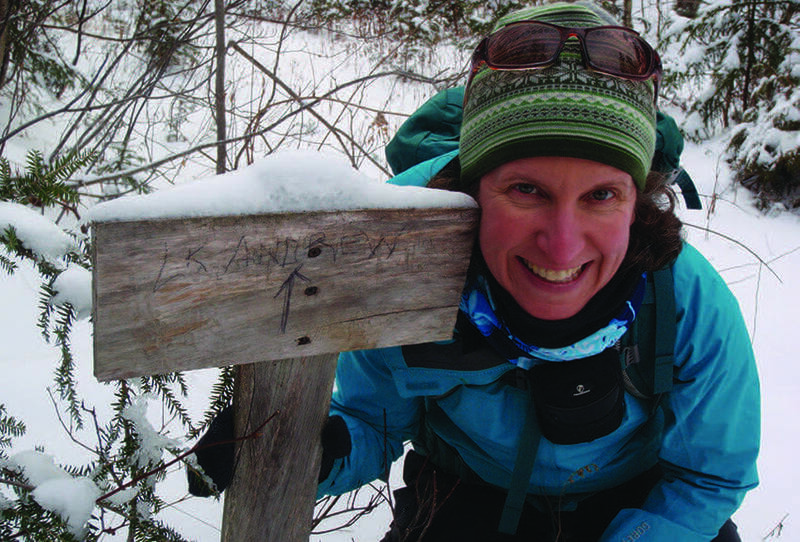 Although Carol and I hiked to Lake Andrew, we could have skied on the logging roads. There were only a few inches of dense snow, but that would have been enough. The skid road that leads to the lake needs at least a few inches more to be skiable. A cross-country tour to Lake Andrew would be a great trip for a novice skier since the roads are wide and smooth. And there are some fun downhills on the return trip. Altogether, you gain 630 feet in the 4.7 miles between the trailhead and the lake. 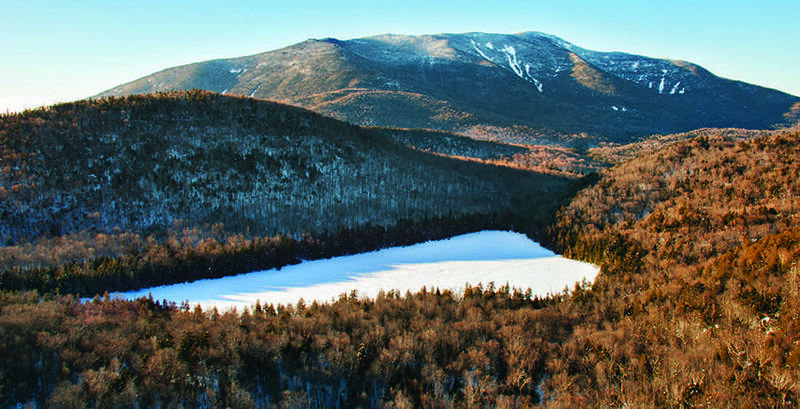 In comparison, the ski trip up the gravel road to Lower Ausable Lake entails a gain of 650 feet over 4.1 miles. However, Lake Andrew is unlikely to be as popular a destination as Lower Ausable, so skiers probably will need to break trail. If the snow is deep, this could be a chore. Even if you don’t like breaking trail, you can keep Lake Andrew in mind for ski trips early in the season or in low-snow years. The parking area for Lake Andrew is off Tahawus Road in Newcomb. It’s the same one used by hikers going to Bradley Pond or Santanoni Peak. 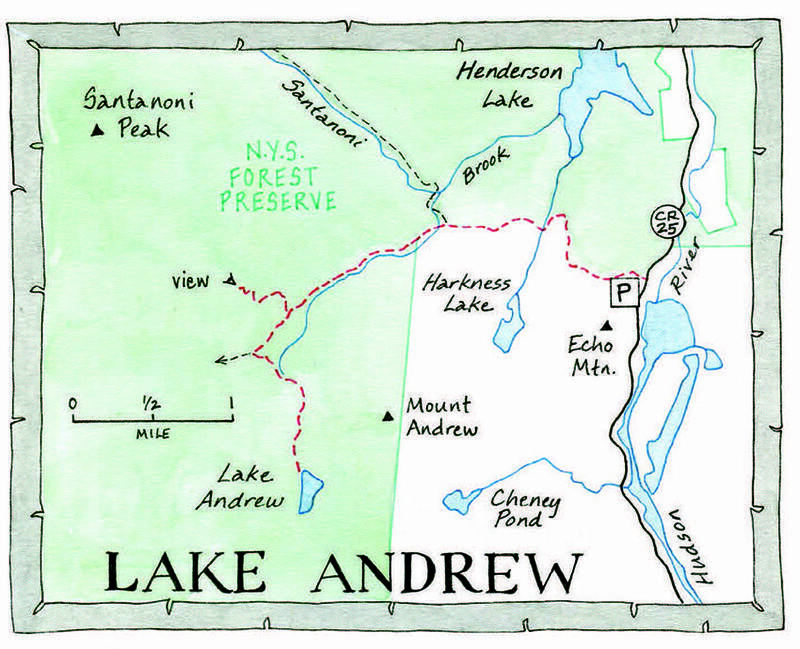 (Lake Andrew is not mentioned on the trailhead sign.) The first part of the logging road—which is gated—is shared by these hikers and marked by blue trail disks. On the Friday morning of our trip, there was one other car in the lot. The occupants had bare-booted up the logging road. As Carol and I followed in their footsteps, we also saw the tracks of other visitors—snowshoe hare and bobcat, perhaps one in pursuit of the other. 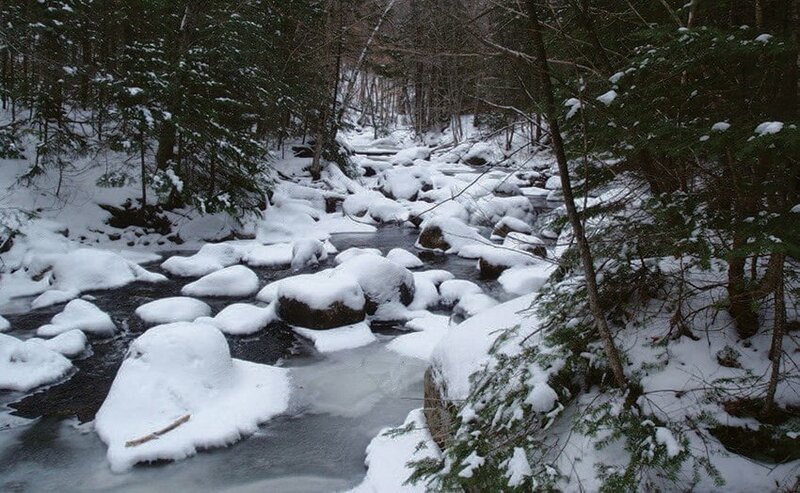 For much of the way, the road parallels a tributary of Santanoni Brook. At 1.1 miles, the road crossed a dark stream winding through a snowy wetland, its grasses and shrubs coated with frost. To the north-northeast, we saw a large peak that I suppose was MacNaughton Mountain. Although it reaches four thousand feet, MacNaughton did not make the list of the forty-six High Peaks because the list was drawn up before its height was known. A little beyond the wetland we caught a glimpse through the trees of the Twin Slides—the first of many views of these bedrock scars on Santanoni’s east slope. At 1.8 miles, we arrived at a junction with a foot trail. Here the hikers who were ahead of us had turned right to follow the blue markers, while Carol and I continued up the road. A hundred yards on, we reached a bridge over a large stream that is a tributary to Santanoni Brook, which flows into Henderson Lake, the source of the Hudson River. A big sign warned: “Go Back. No Trail Access Beyond Here.” Knowing the sign to be no longer operative, we ignored it and crossed the bridge. The road paralleled the stream on our left. At 2.2 miles, we came to a vehicle barrier and another no-trespassing sign at the boundary of the MacIntyre West Tract. Again we kept going and in less than a quarter-mile reached a junction with another good road that veered right and up a hill. We bore left and continued to walk beside the stream. Carol remarked on the beauty and serenity of the hike. Almost three miles from the trailhead, we passed the first hunting camp, a squat, rustic building with a front porch sitting right next to the road. The road descended, then started climbing again—gradual grades, ideal for ski touring. We started to regret that we didn’t bring our skis. All this time we had been following bobcat tracks. We marveled at the efficiency of the feline’s gait: it generally hewed to a straight line, putting its hind paws into the prints left by its front paws. At 3.2 miles, the bobcat veered left onto a narrow skid road, while we stayed on the main road. After 3.3 miles, we reached a T-intersection near a cluster of hunting camps. We suspected the road coming from the right was a continuation of the road we had passed a mile or so earlier. We would test this theory on our return. Turning left, we soon came to another junction at 3.6 miles. Up until here we had been hiking primarily west or southwest. After turning left, we now headed southeast. We passed more hunting camps, including one with a marvelous view of Santanoni. Carol Fox poses near a homemade sign that points the way to Lake Andrew. “Wow, it just gets better,” Carol remarked of the scenery. The maintained road came to an abrupt end at 4.0 miles. We picked up a rough skid road on the right and followed it uphill, crossing three bridges, to a small clearing at 4.2 miles. Here we saw two trails, one going straight, the other going right. Although the trail on the right looked in better shape, the other was marked by a crude wooden sign on which someone had written “Lk Andrew.” So that’s the one we took. Except for some blowdown in a wet area, the trail was easy to follow. It ascended to a junction with a trail coming from the right. (We wondered if it was the continuation of the other trail we had seen in the clearing.) Veering left, we hiked along a flat, muddy section. Finally, at 4.7 miles, we came to a short path leading to the northwest shore of Lake Andrew, where we found a rowboat and small dock. The sixteen-acre lake lies below Mount Andrew. Directly across the lake was a hunting camp. Except for the camp, dock, and rowboat (all of which will eventually be removed), the lake appeared to be as wild as it ever was. The surface had frozen, but it was too early in the season to test the ice, and so we were left wondering what views are to be enjoyed from the middle of the lake. After a snack, we started back. Soon enough we were back on the main road at the T-intersection near the camps. Instead of turning right and retracing our steps, we went straight, thinking this road might reconnect with our route. The road curved left and then started a long, gradual uphill, gaining more than a hundred feet. Although the road didn’t seem to be heading in the right direction, we followed it a half-mile to its end: a clearing with an in-your-face view of Santanoni Peak and the Twin Slides. The view was nice enough that it’s a worthy destination in itself for skiers who want to stick to good roads. The descent from the clearing would be a blast. DIRECTIONS: From Northway Exit 29, drive west on County 2 for 17.8 miles to County 25. Take a right and go 6.4 miles to a junction. Turn left to stay on County 25 and go 2.0 miles to a trailhead sign on the left. Turn here for the parking area.